Rumford fireplaces are great technology – for 1796. Personally, I don’t think anyone should install one today. The Rumford fireplace is named for the man who designed it and wrote about it in the late 18th century, Count Rumford (Benjamin Thompson). The Rumford design features a shallow, tall fire box with a steeply sloping back wall and angled side walls. These details increase the radiant heat to the room compared to the deeper, boxier fireplaces it replaced. Another detail of the Rumford is the design of the throat – the area where the smoke exits. In the Rumford, this is rounded and smaller and efficiently exhausts the smoke with less draw of room air. All of this was innovative at the time and an improvement over previous fireplaces, but today it’s an energy loser. 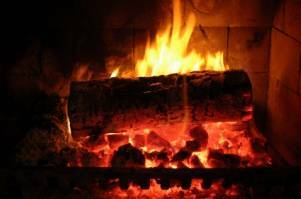 As I mention elsewhere, an open fireplace in a centrally heated home loses more heat up the chimney than it gains from the fire. A Rumford may lose less, but it’s still a net loss. Personally, I don't even like the look of a Rumford fireplace. I don't like the proportions and to me it always appears as if the fire is about to spill out into the room. Modern designs are the way to go. Or consider a masonry heater (also known as a “Russian fireplace”). That design is hundreds of years old and still one of the most efficient. It originated in eastern Europe and has long been popular there and in Scandinavia. I think the only reason it hasn't been more widely adapted is it's expense and the fact that the home needs to more more less be designed around it. You can read more about masonry heaters and other more efficient ways of using wood for heat by clicking the links below.